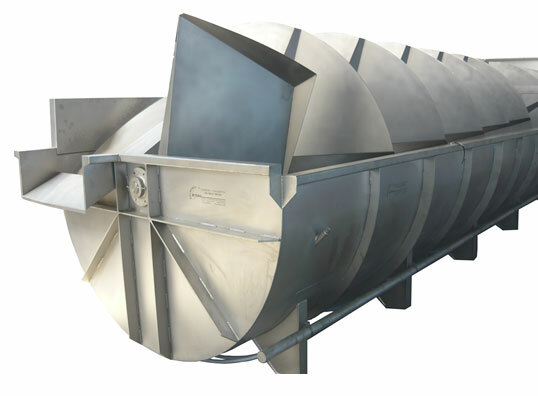 The Screw Chiller / Spin Chiller offers poultry processing plants the possibility of cooling down the eviscerated birds continuously and in a time-saving manner to the core temperatures required. On the drive side of the screw chiller, the birds are fed into the tub, filled with chilled water. A screw with adjustable speed transports the birds gently through the water bath. By constantly blowing air into the bottom area, good mixing of the water and even cooling of the birds is ensured. The cooling water temperature is kept at the required level by means of cooling media to be provided at site, such as ice or cold water heat exchanger. After their passage through the water bath, the birds are removed by an unloader from the container that feeds them e.g. to the drying drum, where adhering water is removed. The screw chiller is available in different lengths and widths which depend on the required capacity. The scope of delivery includes the air blower as well as the control board with a frequency converter for speed adjustment of the screw. Utility connections: installed by the customer according to manufacturer’s guidelines. The length and width of the poultry chiller depends on the capacity and processed bird size.